Adjustable and Secure Fit: Adjustable design expands to fit almost any phone (2.25 to 3.5 inches wide) and keeps it securely fixed throughout your drive.Note: Cradle may not support heavier phones over 5″, or off-road terrain. Versatile Viewing: Highly-flexible ball-joint rotation provides infinite viewing angles. Position your phone at the perfect angle to enjoy a more relaxed and safer drive. Premium Design: Two mount claw alignments offer different fits for air vents of almost any size. The rubberized exterior increases grip and provides superior durability. Easy Fit for Almost Any Vent: Hassle-free mounting is managed in seconds, with no tools required. Note: Narrow axis fits air vent slats sized 1.5 – 2.5mm, thick axis fits 2.5 – 4mm. 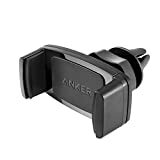 What You Get: Anker Air Vent Car Mount, welcome guide, our worry-free 18-month warranty and friendly customer service. Enjoy safe hands-free phone access on the road. 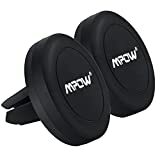 A reinforced base ensures that the car mount stays firmly fixed to your car’s air vent. A secure spring-loaded cradle with silicone-padded grips keeps your phone in-place. A highly-flexible ball joint allows you to easily adjust the car mount to any angle. Built with dual-sized claws to give a perfect fit with almost any air vent. Mount your phone securely without worrying about losing grip. Tool-free installation makes setup foolproof. 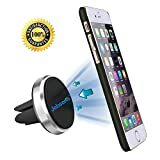 Set up the mount, insert your phone and drive off in under 60 seconds.